I wrote a piece for voiceofsandiego.org, the intent of which was to introduce people to my preferred valuation approach (and to give a quick overview of where we are now). Probably not a whole lot new for longtime Piggs, but possibly of interest to newer readers. A good approach to measuring the “expensiveness” of San Diego housing is to compare home prices with local rents and incomes, which together encompass the most important drivers of home prices. This shows homes to be unusually pricey right now, though nowhere near levels reached during the bubble. Submitted by gzz on October 13, 2016 - 3:33am. Should low interest rates persist? That's what the markets say they will, and for a long time. And boy if they go up, the big loss won't be San Diego landlords with growing rents that exceed fixed-rate mortgages, but the owners of tens of trillions of bonds and gazillions in derivatives. I just don't see any way rates can rise. Demographic and cultural changes in the entire rich world is creating more and more savers and fewer and fewer people who are creditworthy and desire higher interest loans. 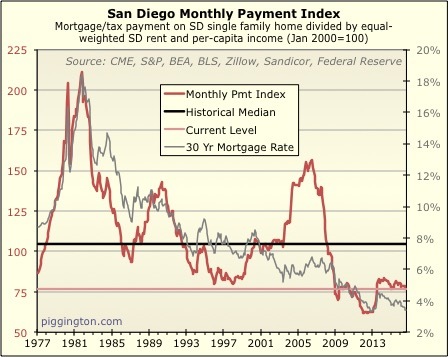 I wonder what will happen to San Diego real estate when 30-year rates hit 2.5%. Submitted by Goofy on October 13, 2016 - 7:45am. Every time I see statements of "new normal" either in terms of low rates or high valuations I have to shake my head. There is no such thing as "new normal", the new normal is exactly the same as the old normal. Barring structural changes in the entire economy, valuation metrics are mean reverting, whether in stocks or real estate. Someone is getting screwed at some point, it is just a matter of time to find out who and how. Submitted by Rich Toscano on October 13, 2016 - 8:54am. In 2005, markets said SD homes should sell for 80% above their historical valuation... that argument is no more valid now than it was then. Submitted by poorgradstudent on October 13, 2016 - 11:39am. I don't see this happening. I see hints of interest rates creeping back up, at least to levels from Spring. Rates seemed ready to creep up before the Brexit vote shocked the system in June 2016. Getting back above 3.5% is going to be a different story, but there's definitely some room for rates to creep up right now, even without any Fed action. Submitted by Rich Toscano on October 13, 2016 - 12:05pm. Unless that changes substantially, that doesn't square with 30 year mortgage rates at 2.5% or, for that matter, at 3.5%. Submitted by moneymaker on October 14, 2016 - 8:03pm. ---It’s possible that low rates (should they persist) or housing supply constraints could support higher-than-typical expensiveness indefinitely. This was also stated in the original article and made me wince, the graphs show everything mean reverts so indefinitely is impossible. The only way the banks are going to get out of this interest rate trap is because home owners on average move every 13 years, which forces a refinance (at a potentially higher rate). Condo owners move at twice that rate however. Submitted by Rich Toscano on October 15, 2016 - 12:43pm. This was also stated in the original article and made me wince, the graphs show everything mean reverts so indefinitely is impossible. It's a data series, not a law of nature. While I think the burden of proof is on those who claim that it won't mean revert, that doesn't make mean reversion a sure thing. There are no sure things, especially when looking at a market that will at some point run into physical supply constraints. Submitted by SD investor on October 16, 2016 - 2:34pm. I think mean reversion will imply valuation will drop and payment will increase. valuation will drop via relatively higher appreciation in rent and wages. Payment will increase via higher rates and potential appreciation. I think wage/rent ratio can be combines and stays constant relative to job and desirability of an area. The fed already signaled rate change will require inflation and wage increase. So if wages go up, rates go up. valuation drops, payment increases, and prices follows 2% long term inflation target. If wages is flat or falls, Fed will do their best to combat it and print money, so not so clear who wins in that case and there will be uncertainty in where prices go. Submitted by Escoguy on October 17, 2016 - 10:06pm. The other day I was driving four Chinese students to dinner while working for Uber. One mentioned the 4,000 Chinese students at UCSD. I asked, what might you and the others do after you graduate? I also drove a riders from Bolivia, Turkey, Japan, Qatar, India, Switzerland, Austria, Germany, Mexico and many other countries and they are all thinking the same thing. San Diego is becoming a very international city and many who come here want to stay because it is unique. Needless to say, I think any softening in the market will be short lived. Submitted by spdrun on October 18, 2016 - 8:20am. "Oil will never drop below $100 per barrel." "The Euro will keep increasing above 1.4 to the dollar." "Gold will hit $2000 and keep rising." San Diego was an international city in 2007-8. Foreign population % hasn't increased that dramatically since then. This didn't stop the correction in housing in 2008-11. As a Uber/taxi driver, you're probably also exposed to a skewed percentage of foreigners, since most Americans would just rent (or own, if they live in the city) a car. Submitted by Escoguy on October 19, 2016 - 9:40pm. Other articles reference workers who came from Mexico who worked in construction leaving. So I think there has been a significant shift and the new arrivals have more wealth and a different perspective. When I worked in Asia/Kuwait/Eastern Europe, I was often told that people want to have a plan in case things go wrong. Given the worries in many other parts of the world, things are looking very solid in the US. As a side note, I'm often surprised by how many 20-22 year old American students don't have a drivers license much less a car. In any event, we can't pretend that SD is some hidden island that remains undiscovered. I've driven many people from New York who have moved here in the past few years. Their friends then visit them out here and think similar thoughts about how much better life is here than in NY/Boston and the whole Northeast. I'm also surprised by how many of my tenants (and applicants) earn in the $150-$200K/range. Long story short, there are some very powerful forces at work here which make it a different market than 2000-2006 or the period from 2008-2011. Submitted by spdrun on October 20, 2016 - 10:04am. (1) Life is not better in San Diego than in the Northeast. If anything, there's more interesting people, more interesting climate, and more diversity in NYC than anywhere in the US. NYC is basically the only American city that I can stand long-term. As a city vs a giant suburb, San Diego has nothing on NYC. You can't freakin' walk in many parts of San Diego. I was there to renovate a rental last year. There was a wide street between the rental and an area of shops. The traffic light was timed so you had to literally run across to make it to the other side without being hit by a car or blocking traffic. Try that if you're older, a child, or carrying something heavy. Plus you have cultural events in NYC that are either free or cheap -- this isn't really the case in San Diego. I love it, can tolerate it in limited doses, but it's an overgrown small town with sucky traffic at heart. (2) 20,000 foreigners is 1.4% of San Diego's total population. (3) Total population increase since 2012 (when the current bubble really got going) has been approx 49,000 people. The increase has been continuous throughout the 2000s. 2012 was not associated with some sort of dramatic change in rate of increase, only a slight one. Submitted by Rich Toscano on October 20, 2016 - 10:26am. I don't know if you were here in 2006, but... these are the exact arguments that people were making back then. That doesn't necessarily make them wrong this time around. But if they are right, you should be looking to rents to confirm it, as a big influx of population should show up in rents too. They really don't confirm it: while rent increases have definitely been healthy, they haven't remotely kept up with home price increases. Submitted by racerexmr2 on October 20, 2016 - 10:44am. The valuation model is home price divided by a combination of income and rent. In my opinion, mean reversion of the valuation model should not necessarily be mixed in with the concept that "things are different this time". In a sense, mean reversion is the decision making process in action of people deciding to buy vs rent. And its tendency to revert is because the ratio is based on probably the most important factors leading to buy vs rent decisions... home price, income, rent. These three factors indirectly already incorporate to a degree all the local subtleties such as demographics, geography, foreign vs domestic money, investors vs owner occupied, interest rates, etc. These aforementioned things are the subtleties that many here are using to say that "things are different this time" because San Diego is "different'. That said, I think the elephant in the room is that the mean can still revert WITH prices staying high and/or higher so long as either wages or rents go up! And I firmly believe that (at least for coastal areas and hot spots) rents will continue to go up given that ALL the areas are built out and demand simply outstrips supply for the forseeable future. So in conclusion, the mean can still revert without home prices necessarily coming down. This is achieved by people paying a more disproportionate percentage of their income towards rent assuming wages stay flat and rents go up. And yes this can be achieved by curbing back on discretionary spending (new iphones, new cars, eating out). Submitted by Rich Toscano on October 20, 2016 - 10:59am. Completely agree that home prices don't need to drop for mean reversion to take place... if things were to mean revert, it could easily be accomplished by home prices holding steady for several years while incomes/rents caught up. This actually happened in the early 80s. Submitted by Escoguy on October 20, 2016 - 11:00am. I think rents are going up. Two of my units went up by 15% this year. Another I could raise by 10% to match the market. I had over 15 applicants in a matter of days. For one house, it was rented in a few hours. The 20,000 persons was just the increase in a two year period. As San Diego's population has been increasing by about 35,000/year over the past decade, a significant portion is from other countries. San Diego is about 23% foreign born according to the US census data link I shared. The discussion was meant to show that SD is continuing to attract a lot of interest from foreigners and from my conversations with them, a fair number want to stay and buy here. I've been here about 1/2 the time since 2000, there is definitely a different blend of population than 16 years ago and construction is not keeping up with the influx. Some groups of students are paying $3800 a month for a 4BR houses in North Clairemont. 15 years ago, those would have gone for $2200. In 2006, I could get $2000 a month for a 4BR house I now rent for $3300. So to me this is a completely different world. I didn't own my other four local properties in 2006 (purchased in 2013) but the markets are similar. And don't take this that I want more development or that I want to block foreign born. I'm just a businessman responding to the environment I see. If I'm wrong I'd like to know but please read my posts carefully as I do try to take the time to find relevant data points for discussion. On balance I prefer to make modest rent increases but when there is vacancy, I will catch up to the market and those changes have been significant. Submitted by Rich Toscano on October 20, 2016 - 12:04pm. Nobody is denying rents are going up. The issue is how much they've gone up vs. how much home prices have gone up; that's what the valuation charts are all about. Arguing that rents are going up doesn't address the issue that prices have ALREADY outpaced rents by quite a bit. Submitted by gzz on October 21, 2016 - 11:13pm. Regarding the CPI chart, consumer prices do not drive interest rates, supply and demand for loanable funds do. The supply is high and growing every year due to economic inequality growing: rich people save more of their income. The demand for loanable funds by creditworthy people and institutions is not growing. Also, it seems like Millennials, other than student loans, are extremely adverse to consumer debt. Sure they have, but that's because local real estate was absurdly underpriced for a few years compared to rents. At the moment, buying is still much cheaper than renting for primary residence if you would get the mortgage interest and property tax deduction. For investment, it is roughly break even on cash flow, but it is a good bet that rents will rise while mortgage payments will not. So both groups of buyers will keep buying based on fundamentals, not speculation. But speculators will probably keep buying too, along with foreign buyers who care about the security of their money and having a U.S. residence somewhere nice, not economic fundamentals. Submitted by AN on October 21, 2016 - 11:53pm. Rich, I think we all agree on mean reversion. Our differences is whether it's going to be price or monthly payment that will do the reverting. You mentioned that rate is at an unprecedented level. However, looking back at history, it has been dropping for 35 years. Do you think it's different this time and it'll change course? If so, where would the median be if rates mean reverted? Look at how high the monthly payment index got in 1981. Wouldn't that show you how much room we have left? Just look at the last 3 crashes, the monthly payment index were ~200, ~140, and ~160. We're currently at 75 just to give some perspective. Assuming price, income, and rent stop where they're at, how high would rates have to rise to bring this index to 140? Submitted by phaster on October 22, 2016 - 8:58am. just a thought, since economies from around the world are all some how tied together (i.e. those who have money seek safe havens and the greatest return, in london, tokyo, NYC, shanghai, sydney, etc.) ever compare "prices" in various real estate markets? Submitted by Rich Toscano on October 23, 2016 - 9:16am. "Look at how high the monthly payment index got in 1981. Wouldn't that show you how much room we have left?" You could have said the exact same thing in 2005 -- that we have room left before getting the 80s highs. Are you saying that homes were not horribly overpriced in 2005? Or that they were less overpriced than in the 80s? I disagree on both counts. This is one of many examples where the payment index would give a bad signal on valuation. It seems to me that this series does mean revert, but it mean reverts around interest rates (the gray line). Submitted by Rich Toscano on October 23, 2016 - 9:22am. And supply of loanable funds (at a given rate) are heavily driven by inflation expectations. At the moment, buying is still much cheaper than renting for primary residence if you would get the mortgage interest and property tax deduction. For investment, it is roughly break even on cash flow, but it is a good bet that rents will rise while mortgage payments will not. So both groups of buyers will keep buying based on fundamentals, not speculation. But speculators will probably keep buying too, along with foreign buyers who care about the security of their money and having a U.S. residence somewhere nice, not economic fundamentals. Putting aside whether it's "much" cheaper (I don't think it is), this argument only works if interest rates stay low. I agree that the low rates offset the high purchase prices to a large degree, as I've said elsewhere. I'm just trying to disentangle the two issues... prices are one thing, and rates are another (and both of them can and do change over time). Submitted by AN on October 23, 2016 - 5:26pm. No, I couldn't have said the same thing in 2005, since it was above 1990 level, so it is bound to mean revert, since both price and payment index are well above the historical mean. Whether it's more or less over valued than 1981 is irrelevant. I'm not debating on which era is more over valued. I'm just trying to point out the diversion of the price vs payment index and where we're going from here. If you're right and price decline like the last 3 peaks, since we're at a much higher point than 1981, then we'll end up with a much much cheaper payment index (monthly payment vs rent). It's already at historical low now, so you're contending that it will be different this time. It's not as straight forward to predict like the last 3 peaks, since this time, it is truly different. I personally don't know for sure which index will mean revert first. I personally think it's more likely that the payment index will be the one that will do it. Which mean price can stay the same, interest rises, while rent/income stay flat. Which will bring the payment index back to historical mean. I guess we'll see soon enough (in the next 5 years). Which is why I pose a question for you. How high would interest rate have to rise before the payment index will reach 1981, 1991, 2005 level without having price increasing as well. That's what I mean by how much room we have left to run if we hold other variable constant. Submitted by Rich Toscano on October 24, 2016 - 4:05pm. I see what you mean, but a couple things. - I didn't say that prices will decline. - I'm not saying this time is different... not sure where you got that. - The payment graph, to my eye, is not mean reverting. It's strongly down-sloping and has basically just followed the downward slope of interest rates. Presumably, if rates go up, it will go up again. The valuation index has been far more mean reverting (ie, it reverts around an actual mean, at least to a pretty good extent, as opposed to just following rates around). So I don't see them as being equally informative. To me the payment graph is interesting, but isn't terribly informative unless you know where rates are going. I guess that's the point I'm trying to get across. Submitted by AN on October 25, 2016 - 12:34am. Sorry if that was an incorrect assumption. When I read that you think the value index will mean revert, I read that as, price will fall to bring price back down to historical mean. If you did not mean that, then how do you think valuation index will mean revert? Submitted by Rich Toscano on October 25, 2016 - 8:00am. "It's a data series, not a law of nature. While I think the burden of proof is on those who claim that it won't mean revert, that doesn't make mean reversion a sure thing. There are no sure things, especially when looking at a market that will at some point run into physical supply constraints." If it does mean revert, it's entirely possible for this to happen via home prices leveling off while the fundamentals catch up. At the current rate of income/rent growth, it would only take a bit over 4 years of flat prices for us to get back to the median valuation. Submitted by Escoguy on October 28, 2016 - 10:40pm. Because of its rapid economic growth, the number of Chinese dollar millionaires is expected to reach 2.3 million by 2020, a 74 percent increase compared to today. Largely due to China, Asia was responsible for 70 percent of all new billionaire wealth in 2015. Chinese investors favor real estate as an asset class. Chinese purchasers acquired at least US$350 billion of U.S. real estate between 2010 and 2015. 69 percent of Chinese purchase on an all-cash basis. Between 2009 and 2015, Chinese buyers went from accounting for 10 percent to 28 percent of all foreign residential real estate acquisitions in the U.S. In the same period, its annual investment level increased more than nine-fold. Looking forward, Chinese buyers are expected to continue their international real estate purchasing spree. The best estimate is that they will spend at least US$218 billion on existing U.S. real estate between 2016 and 2020 – with investments in the rest of the world on a similar scale. As mentioned before, there are thousands of Chinese students in San Diego already. It is not hard to make the connection that these are the children of the new millionaire class in China. There are only so many world class cities which attract the investment. Even if SD only attracts 2% of the $218 billion, that would be over $4 billion in purchases or at a median price of $500K = 8,000 homes/condos/apartments which is a substantial portion of current and future inventory in the region. Submitted by FlyerInHi on November 2, 2016 - 12:34am. I was think the same thing though I keep on waiting for dollar debasement and skyrocketing rates when the Fed loses control and market forces take over. I'm saying this facetiously because people keep predicting. Submitted by poorgradstudent on November 3, 2016 - 4:43pm. I wouldn't live in NYC if my rent was free. I'm about a decade too old to tolerate dense urban living. Submitted by Escoguy on November 3, 2016 - 5:21pm. You can structure you finances and get pretty close to that depending on your particular situation. Some of this was driven by Brexit. Frankly if anything, I'd prefer to pay down principal slower as now I'm paying 33K/year in principal which is fine but there are times I'd be fine with the debt going down slower too. If the economy slows, may even shift one more fixed to variable, that would bring the average to 2.5% and save another $740/month.